Two highly acclaimed Ford cars will head to the 20th Goodwood Festival of Speed this summer, Ford’s 1.0-liter EcoBoost FF1 and the Fiesta ST. The Ford FF1 1.0-liter EcoBoost track car that set a blistering pace at the Germany’s famed Nurburgring Nordschleife circuit is headed to the 20th Goodwood Festival of Speed in July. The one-off single-seat racer completed the lap in 7 minutes, 22 seconds to register the 11th fastest time ever on the circuit back in August. The incredible time put it ahead of a host of supercars including the 700 horsepower Lamborghini Aventador, 660 hp Ferrari Enzo and 602 hp Pagani Zonda. No other three or four-cylinder car has posted a faster time at the legendary circuit. How does Ford produce an incredible 118 mpg from 1.0-liter EcoBoost in a FF1 street-legal race car? The road-legal car with a top speed of almost 160 mph and 0-62 mph times of less than four seconds, is also capable of getting incredible fuel mileage when its driven efficiently. The 1.0-liter EcoBoost engine is fast and it’s stingy on fuel consumption. 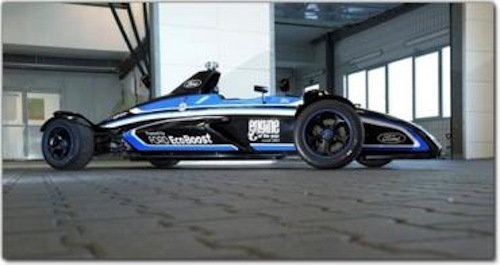 Ford says in-house testing showed the 1.0-liter EcoBoost-powered Formula Ford is capable of delivering fuel economy of 118 mpg at 35 mph, and 57 mpg at 75 mph. The super-efficient FF1 is lightweight and Ford is proving that the 1.0-liter EcoBoost can produce both high performance and outstanding fuel economy. The tiny but powerful three-cylinder Ford 1.0-liter EcoBoost was recently named 2012 “International Engine of the Year”. Ford will showcase the small but mighty engine in the FF1 at the famous Goodwood hillclimb and it will also be on display in the FoS-TECH area during the Festival. Ford says it’s become the UK’s leading exhibition promoting state-of-the-art green and environmentally friendly technologies as well as looking into the future of transportation. And the future is now as Ford is already using the 1.0-liter EcoBoost extensively in Europe in the Ford Focus, B-MAX, new Fiesta and C-MAX. The European Ford Fiesta ST will also be showcased at Goodwood and will be at the Moving Motor Show on Thursday 11 July. The Moving Motor Show is a preview day for the Festival of Speed and allows car enthusiasts the chance to see the industry’s latest models, with manufacturers using the famous Goodwood Hill to demonstrate their newest products. Ford will also bring the legendary Ford GT40 models from the company’s UK heritage collection to the Goodwood Revival on September 13-15 to celebrate the 50th anniversary of the start of development of the classic endurance racer. A first-ever unique all-Ford GT40 race will be held called the Whitsun Trophy race during the festivities. Ford’s award winning 1.0-liter EcoBoost FF1 track car continues to impress and will make its public debut in the UK at the 20th Goodwood Festival of Speed, taking place from July 11-14.